It’s now been five years since Lola (formerly known as Lolabelle the Magnificent) arrived home from the shelter. Five years of dancing in the rafters of catladyhood. Five years of waking at dawn to the sound of bathtub yodeling and the scampering of fury, ham hock legs running the length of the house, back and forth, back and forth. Five years of hugs. Five years of hats. Five years of Lola. We celebrate this day of wonder with long naps, bad breath, and a hefty helping of Lola’s favorite treat – goldfish crackers. Later on, Lola will snuzzle up on the warmth of a laptop keyboard and watch Mexican soap operas on Youtube, thus honoring her spicy Latina heritage and keeping her occupied while dinner preparations take place – a takeout feast from her favorite restaurant, Wholy Frijoles. Tacos for everyone! Happy birthday Lola! Lola looks fabulous in feathers. Happy Birthday! Happy Birthday, Lola! My girls, Mija and Pilchard send their warmest regards, at least, I think that’s what they said when I woke them up. No doubt. Mija and Pilchard are very thoughtful. Lola says thank you! Oh, Aunt Peaches, you are just adorable. I’ve been so unorganized, I missed it! Pin the flag pin on her hat, okay? I do have a hat that I am decorating for Lola. I just don’t know her favorite color. Prettiest cat ever! Best cat hat model, also! Those feathers are adorable! What a snazzy lady. 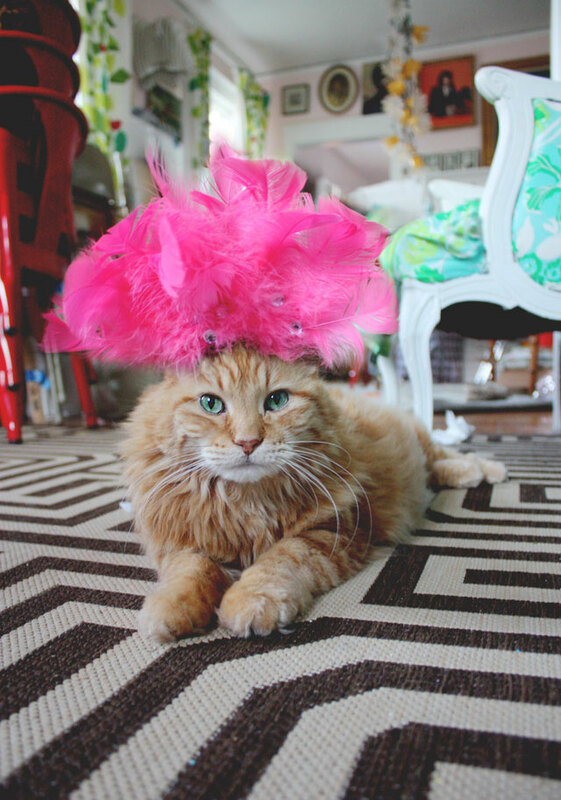 I have my own orange kitty but I don’t think he would appreciate a feathered accessory, unless I let him eat it. I am glad you got some special time together. Lola and I send our biggest hugs your way. Mew. Does she really eat goldfish crackers? That is way funny! Happy birthday, famous kitty! She does! She loves them more than cat treats. I only give her one or two tops, but she comes running if she hears the bag rustle on the shelf. She got her head stuck in the bag one time (like Maru)…I wish I had a camera. Fantastico! Best cat wishes for many more years. That beautiful gal was just made to wear feathers! All local birds should take note quickly! Happiest Birthdays Lola. You’re an absolute stunner, girley! Hey Lynn! 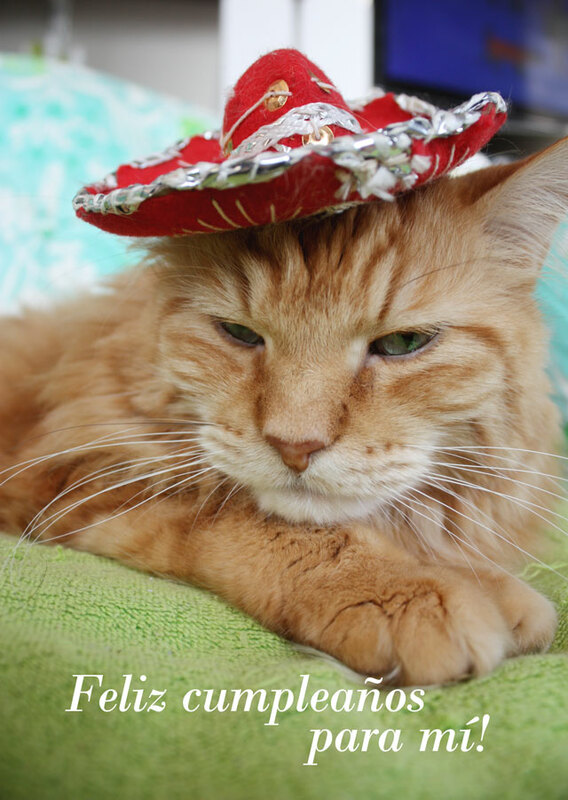 Yes, I have to get Lola drunk on catnip sometimes — not for hats, but other things. You got to do what you got to do! Feliz Cumple Lola, te lo desea de todo corazón tu cat-amiga de Italia, Clotilde, que dentro de unas semana va a festejar su tercero año de edad! Oh I can’t remember what post it was, but you said that Lola loves Easter Eggs so I got some and what my kitty (not Durn but Little Bit) loves in them more than Jingle Bells are get ready bottle caps. She is a cheap date. She loves bottle caps, plastic or metal and will play with them and bring them back to you like a dog for you to throw again. So with the Easter Eggs with them in it she gets so excited and even does a cute meow “Reeeeeeeow rannnnnnnnnnnnnow” when you throw it. Cuuuuuuuuuuute. That is Lola asking when her you are coming over to make ticket stub art? Lola is gorgeous! Happy birthday! Happiest Birthday Wishes Lola! You gorgeous girl you! Happy Birthday Lola. 5? You are still a baby! Snouty kisses!